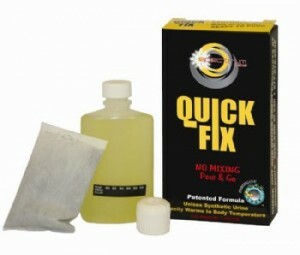 The Quick Fix synthetic urine is premixed laboratory urine designed to protect your privacy during a urinary drug (THC, marijuana, cocaine, ecstasy, pollutants) test or drugs test.cocaine, ecstasy, pollutants) test or drugs test. Comes complete with temperature strip on bottle, heat pad and squirt lid. Instructions included!